Say hello to this amazing Crispy Chicken Tacos Recipe. 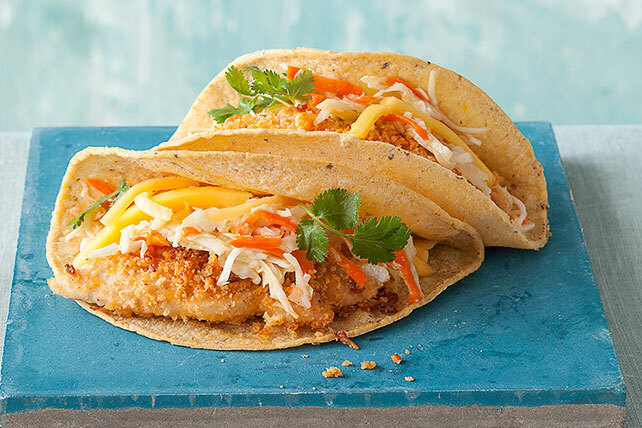 This Crispy Chicken Tacos Recipe is sure to be your family's new favorite weeknight dish. Combine coating mix and seasonings in medium bowl; stir in cheese. Moisten chicken with water; dip chicken pieces, 1 at a time, into cheese mixture. Lightly press cheese mixture onto both sides of chicken. (Chicken will not be completely coated.) Place on baking sheet sprayed with cooking spray; top with any remaining cheese mixture. Bake 15 to 18 min. or until done (165ºF). Meanwhile, toss coleslaw with dressing. Top tortillas with chicken, coleslaw and mangos; fold in half. We really love this recipe which was originally developed using our recently discontinued FRESH TAKE Cheese Bread Crumb Mix. We revised it to use KRAFT Shredded Cheese, SHAKE 'N BAKE Coating Mix and seasonings. Our Kraft Kitchens team has developed substitutions for the entire FRESH TAKE lineup so that you can continue to enjoy the great taste of these products. Click here for our Spicy Chipotle Cheddar substitution guide. Give it a try!